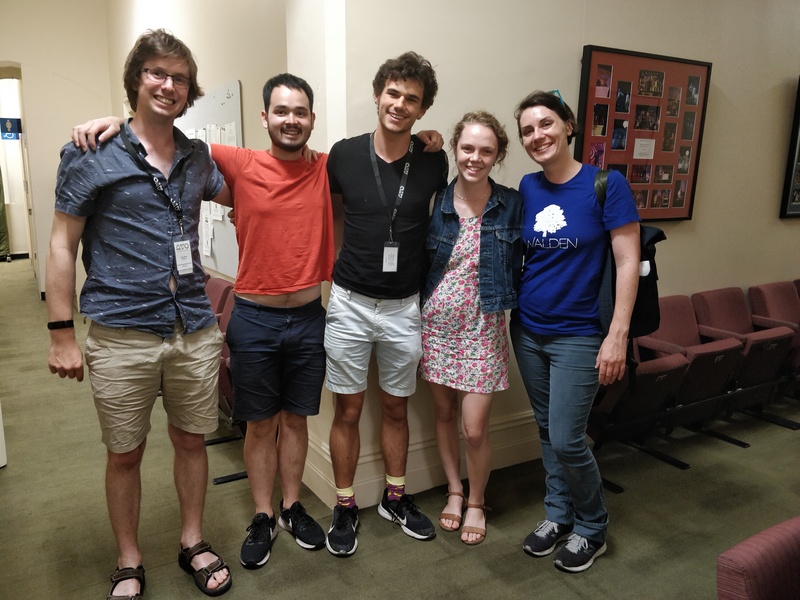 During National Music Camp, Christopher Healey, fellow composer and member of the Words About Music team, met with composer Melody Eötvös to discuss her music, the business of composing and the future of the art form. In the course of his work at NMC, Christopher prepared this podcast about Melody and the blog post below. I think it came as somewhat of a relief when you realised you could compose? It stemmed from any kind of performance that I had to do — and I’m going to say I had to do it because I didn’t do it of my own free will. I was terrified to the point of freezing on stage, and the first time I performed my mother had to come and get me off the stage. So, I think when I was 14 I started composing, and the funny thing happened where I went to perform my own composition and that level of nervous wreck inside me no longer existed. I think in my brain I had realised “If I make a mistake it doesn’t matter, it’s my music, whatever!” That changed the game for me, and the performance of all music that wasn’t my own stopped after that point. My parents didn’t seem to mind. In fact I think they realised what was going on. So they were supportive of the transition to composing? Absolutely. They didn’t like the way I finished my pieces because they wanted a traditional cadence, and I was like no! Rebellious even at 14, then? Was there anything in particular that inspired you to become a composer, or was it just the realisation that you could? It’s kind of embarrassing. Near the beginning of high school, I had a crush on a boy and I needed an outlet because I was very introverted, so I found a way to map notes to the alphabet and create a tune based on his name. It was ridiculous. I doubt he cares. We lost touch a long time ago. Writing that piece though was a way for me to realise that I could use music in a different way from what I had always thought was a possibility: “you have to learn these notes, they have to be played like this”. There’s a degree of interpretation you can apply to that, but composing is a completely different story and I just latched on to it so quickly. It changed everything. You’ve been living the life of a composer for quite a few years now, has there been any career highlights? I always love working with the Tasmanian Symphony Orchestra. 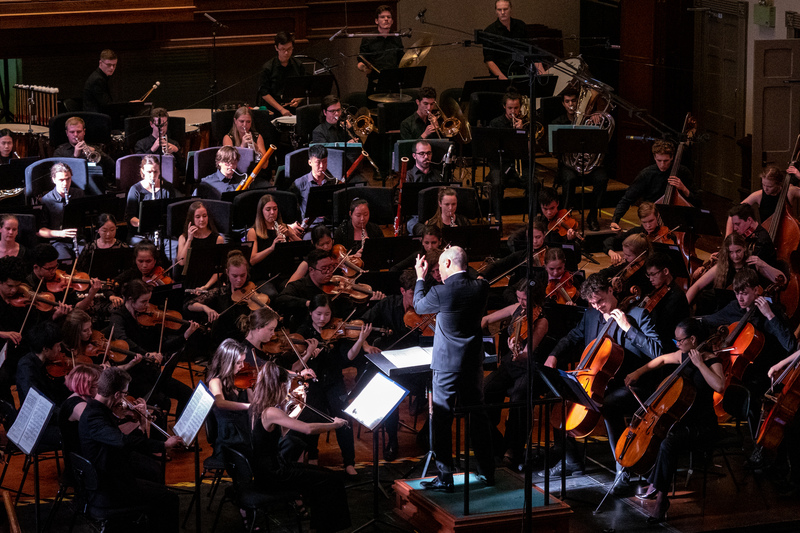 You have your dream academic job and your dream composition job, and in 2016 and 2018, the Tasmanian Symphony Orchestra made that come true for me. I wrote two pieces for them two years apart and, without a doubt, that’s definitely been the highlight. For people who haven’t heard your music, how would you describe it to them? How would you entice them into listening? This is a tricky question, but it’s important for a composer, because we don’t want to put ourselves in a box, but to a degree you have to if you want to try and explain your music to somebody. The best answer I have to that is courtesy of American composer Steven Mackey, who was listening to my music and said: “It’s very pagan,” and I had to try and figure out what he meant by that, but it does have an old, kind of ancient sound to it… I guess because of modality and the way I use that, but then again, it’s new music as well, so… a new pagan-ness? It’s interesting that you mention that influence, because the work you have in the NMC program has been heavily influenced by some Greek ideas. Yes, Attic Tragedy, my first orchestral piece, was written for one of the Tasmanian Symphony Orchestra composers’ schools back in 2008. The piece is based on an ancient form of Greek drama. I came across it through a secondary source, not directly through reading it in an encyclopaedia, but through Nietzsche, whose work I was studying in my Master of Arts and Philosophy degree at the University of Queensland at the time. The 18 months while I was doing that degree was a funny period for my composing, because I wasn’t having composition lessons at all. So, I had the freedom to be myself in a way I hadn’t before, and it was sandwiched right in between my Master’s and my doctorate in the United States. During this amazing period in my composing life, I just latched on to all these different philosophical ideas. But I love Nietzsche; he can be depressing at times, mindless, nihilistic and all of that, but you have the dualisms that he explores, in particular the Dionysian and the Apollonian. For me, when writing a piece, especially an orchestral piece, movements are a much better way to get a piece written faster. I didn’t have too much time to write this piece, so I went after movements, and I chose to write four of them. I actually started writing a fifth, but for the life of me, I cannot find where I put those drafts, and it breaks my heart. Maybe I will find them one day? Bishop Orchestra performs Attic Tragedy at AYO National Music Camp under the baton of Ariel Zuckermann. Attic Tragedy also has some quite interesting movement titles, are they related to this form of drama? Absolutely. I took this directly from what I read in Nietzsche about the different sections of the drama. In the first movement, I took Agon, which is The Challenge, then we move to The Messenger, which speaks for itself. After that is Threnos, which is like a lament. Last is Anagnorisis which is The Revelation. The work has a really nice narrative arc to it. It’s also been interesting listening to the current rehearsals, because the Bishop Orchestra and conductor Ariel Zuckermann are treating it as attacca from one movement to the next, and originally that’s not what I intended. So, it’s fun hearing it played seamlessly between the four movements like that, but we’ll have to figure out whether I want that in the performance or not. This idea of the Dionysian and Apollonian — with the Dionysian representing something like chaos and emotion, and the Apollonian representing perhaps order and rationality — has been explored throughout cultural and artistic history. Where do you think music currently sits between these two poles? If you consider 20 years ago, in the 1990s, when I started composing, and then think ahead 30 years in the future, I don’t know if there is going to be much of a difference. We’ve entered a period of really strong stability, in that everyone is doing whatever they want, and you can go and write a neo-Renaissance piece if you want, or you can be completely open and abstract and aleatoric — whatever it is you want to do — as long as you’re being true to yourself as a composer. In terms of control versus chaos? From the outside looking in, it could be interpreted as chaos because everyone is doing their own thing, and there’s not really a particular style that a historian might latch on to, but in a hundred years, they’ll look back and will call this period something, even amidst that chaos, or seeming chaos. Within the context of Attic Tragedy, do you think one of those forces won out in the end, or do they stay forever locked in mortal combat? I wrote this piece ten years ago, so reconnecting with it in terms of what I was thinking at the time is really difficult. All I can do now is listen to the piece itself and imagine what I was supposing at the time. At the time I would have considered myself more Dionysian. I was drinking wine every night, in between music degrees, having a lot of fun and exploring stuff. So, in that regard, it was probably more Dionysian in terms of lifestyle, but I’ve been studying for the past decade, so that speaks volumes for the Apollonian in me as well. What is it like hearing it again many years after you wrote it? Are you still happy with it? I am. As I wasn’t getting any composition lessons at the time, it was 100% me. There were no other influences or anything. It’s the kind of piece that I think is always going to stand apart from everything else I wrote. Coming back to it now, it’s its own thing; I couldn’t write like that now. I was thinking about that in the rehearsal today and going: “Gosh, that’s a really cool line. 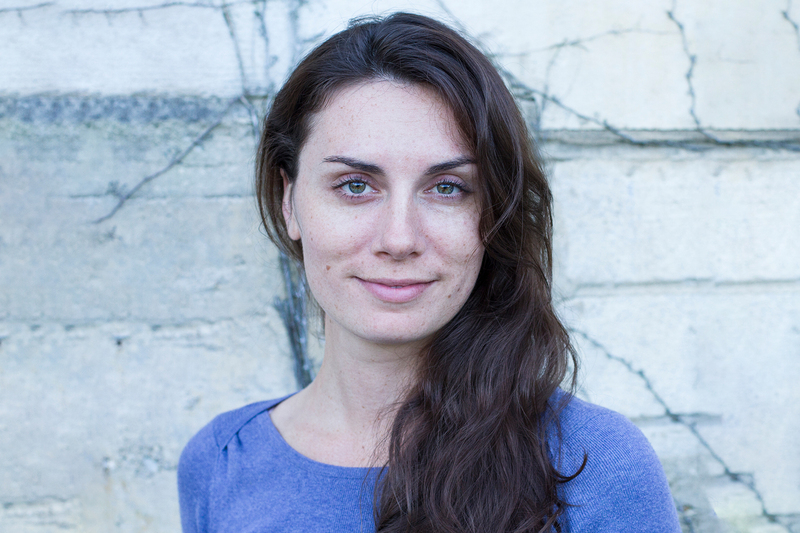 There’s no way I would be able to do that now.” It’s just clean and I tend to be a little busier with my writing now in terms of the ideas that are invested in the piece. In Attic Tragedy, each of the movements are just tiny little self-contained postcard-like things. Do you have any dream pieces for the future? Yes! I kind of had a little taste of opera writing in the United States, but there were circumstances with the production, and it ended up not being quite what I imagined. Besides that, and the epic-ness of writing and opera, I’ve always wanted to write a ballet, and somehow have never ventured into that field. I think a decent-sized ballet collaboration would quite nice. As this year’s AYO composition tutor, do you find yourself with any specific words of wisdom for the composers of the next generation? I’m still considered a mid-career composer apparently. So, I’m of the generation where we have to do everything ourselves. It’s not a bad thing, but we do have to be good at multitasking and taking care of every aspect of being a composer. Not only do we write the music but we typeset it, we publish it, we promote ourselves, we look after every aspect of our craft, and because of that, we end up having to make sacrifices in certain other areas like applying for opportunities and those kind of things. So, it’s important to look after the relationships you’ve built. That was particularly difficult for me, living in the United States and managing all of my connections in Australia; now I have to do it the other way around. It’s all about being mindful of everything you need to look after, which requires discipline and scheduling. You’re not just a composer anymore, you’re also now a mother. Do you have any musical aspirations for your son? As a composer, I’m always going to say pianist, but that’s a tough question because I was brought up with enforced piano lessons. “You’re all going to play the piano, you’re all going to practice however many hours a day” so I don’t want to be so neurotic about it, but at the same time, music is as important as maths. Now for a final, and especially important question for any composer: Sibelius or Finale? Welcome back to Australia. It’s wonderful to have you back!